The notions of motivation and work performance have become a popular driving force behind most successful organisations. Kitgum District Local Government has made numerous efforts towards the motivation of its workers but the challenge facing the implementation of these measures continues to persist. 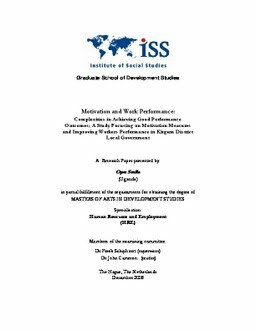 This study is undertaken in Kitgum District Local Government and its focus is geared towards establishing reasons why workers are not performing satisfactorily, what motivational measures are in place and what can be done to ensure there is improvement. The study is both qualitative and quantitative and an exploratory approach was used. In order to respond to the research questions purposive sampling was done and 40 respondents were selected from the pool of workers. The study also used three motivational theories to explain how people can be best motivated as well as an insight of the human resource management paradigm. It was also able to make an overview of the efforts made by the human resource office to ensure workers are motivated to perform well and the performance of the district in relation to the Local Government national assessment exercise. A detailed analysis is made based on the responses from the questionnaires from both the upper and middle cadres. Finally the conclusion of the study is not firm because of the following issues, although the respondents perceive that there has been a considerable success in the use of both the hygiene factors and motivators the reality may depart greatly from this standpoint. In a situation were the findings are correct then we can conclude that the hygiene factors such as working conditions, work relations, physical environment, supervision and job security, as argued by Herzberg should be able to form the baseline that can then stimulate the motivators such as achievement, recognition, responsibility ,advancement and training, to motivate the workers to perform well. In that light the motivation in Kitgum District Local Government is seen to be good and therefore the resultant good performance. However in the findings three quarter of the middle cadres consented to having heard complaints in relation to the poor performance of the district workers. This brings a new dimension of poor performance against good motivation. In addition the problem statement shows a dysfunctional organisation and the assumption of the study is not supported by the findings. These contradicting issues raise a lot of doubts in the researchers mind and it is only through further research that clarity can be put to some of these issues. The researcher for the above reasons is not confident to come up with an absolute position that workers at the District Local Council are not so dissatisfied with motivation and that performance is good but the findings support that position. As stated earlier there is need for more research.